The sandwich industry continues to evolve with new products, formats and ingredients being developed every day. 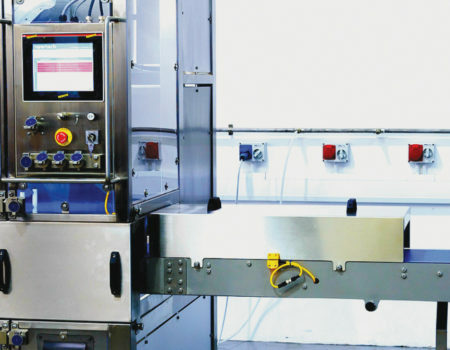 We have created our automated sandwich cutter solution to give you a high degree of flexibility on one machine, future-proofing your investment. Our intelligent robotic cutter integrates advanced motion control, ultrasonics, and vision technology to cut sandwiches and wraps with high accuracy and speed. Our wrap and sandwich cutting system recognises the exact position of products on the conveyor, regardless of orientation, and communicates this to the motion control system, allowing a perfect cut to be achieved, all without stopping the conveyor. To find out more about how newtech can meet your specific product needs, just follow one of the links above. Alternatively, contact us today to speak to a member of our team. To find out how a newtech machine can increase your product’s throughput, solve your cutting challenges and ultimately save your business money, contact us now. At newtech we take your privacy seriously and will only use your personal information to administer your account and to provide the products and services or information you have requested from us. However, from time to time we would like to contact you with details of other products or services we feel may be of interest to you. If you consent to us contacting you for this purpose, please indicate to say how you would like us to contact you either by phone or email (or both) in the message.